Great for Irish trad music! 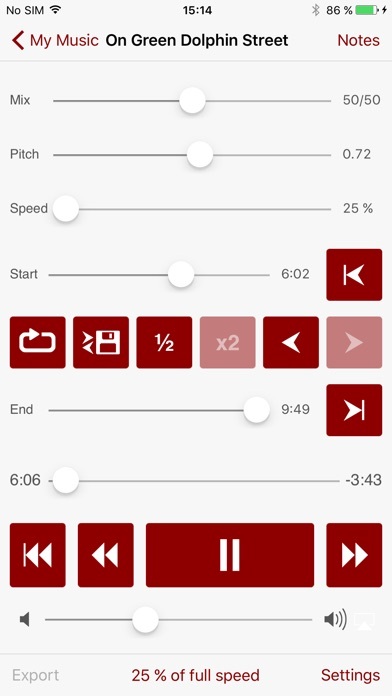 Why did I not buy this app years ago... perfect for slowing down fast session recordings to get those five pesky notes you can't un-jumble at speed. Highly recommend! I switched to a new phone after purchasing the app for $15 and reached out to roni music to see if I could download the app on my new phone. They said no!! One star for greed! I already paid for the app why would switching devices make a difference? Simply deactivate the old app! Find another slow down app that actually cooperated with its paying customers! I think this is the first review I have ever written. Normally I wouldn’t go out of my way, but this app has truly revolutionized the way I teach and practice. Everyone who plays an instrument needs this app! Also, a couple of days ago, I was having trouble with the app, which was probably due to Spotifys servers being down. I emailed the company and got a quick response and shortly the problem was fixed. It was at that moment, I realized how much I depend on this app! Worth everything you pay and more! Hit or miss with Spotify connection. Cool app, but unreliable functionality is unacceptable especially when using it for teaching purposes. RONI is amazing. Responds quickly. Great customer service. Great app. Thanks!!! This is so beneficial. Thanks for taking shed time to build the features. Every collaborative pianist needs this. Get it. You kill two birds with one stone by learning your part with careful practice while simultaneously learning your partners parts aurally. I just wish the app was more fun to look at. Daily use as a guitarist! This app is simply ... “Amazing”. I use it constantly to slow down difficult Guitar passages AND then loop them so I can practice long or short sections. It is perfect for learning solos or riffs with difficult timing. The sound quality is terrific though (as another reviewer mentioned) some distortion becomes audible at very slow speeds, but it is not intense distortion and doesn’t prevent hearing what you are trying to learn. Because I am using either MP3 or AAC, I’m sure the distortion is due to file compression. Having said that, there is zero doubt that I am a better guitarist because of this app. I would buy it again in a heartbeat due to its ease of use and solid feature set! I’ve had ASD app on my MacPro for many years and use it daily but have to cart it around when not at home. This app for iPhone couldn’t be better. Now I have ASD in my pocket wherever I go! The most indispensable app I have! I use it for learning tricky passages, finding which key is comfortable to sing in, and for practicing licks in different keys. I tell everybody about it! And it goes with me from device to device without any problems. At first I was a little scared by the price tag, but I have found this to be an amazing program and definitely recommend it. I’ve used this app to learn a ton of songs. I’m a professional singer, musician and actor and this has served me very well. Perfect for singers who need different keys than the originals, and also to learn the words. I like to speed each song up to practice the lyrics faster so that when I sing it at tempo I can think faster than the words. If you’re looking for a tool to practice songs as a singer or instrumentalist, there’s no better app to do it. I never leave reviews. This one is special. Also, to the developer, please don’t ever abandon it, I need it! Thanks! I'm a classical singer who has been relying upon this wonderful app for years. If I have a recording of a song's accompaniment, the app can transpose it so I can try it in different keys, or I can slow down passages to work on them (and set it up to repeat that section over and over again while I practice it). It is very reliable, doesn't take long to download and update, and I have nothing but admiration for the developer. Great for slowing down difficult percussion passages. Some distortion is present at very slow speeds, but it's still completely workable. Didn't read all other reviews, but if you come across a "protected" file that won't import - there's a way around that too. ————- Checking back in on this app in 2018. I’ve used it religiously for the past 6 1/2 years and it is STILL amazing. Someone complained that it was too expensive at $15 (a few years ago). Are you kidding me?? For the serious musician that works at getting things right, this app is priceless. Given the amount of use, time saved, and difficult passages learned - I would in retrospect have gladly paid $50 for this. Regular updates keep it working smoothly. I also dislike that it won’t import protected songs from iTunes (which I HAVE paid for). Not the app designer’s issue - it’s Apple’s. But you can simply burn the songs you want to slow down onto a CD as a regular mp3 file, then import that version into your ITunes and import it into ASD. It’s an extra step, but again, if you’re serious, it works and is worth it. THANK YOU, app designer - this has been a godsend! The addition of Spotify integration has mad this app worth every penny. As a drummer there's no better way of learning a song than by slowing it down and this app makes that 1 million times easier. It works well with spotify. But since apple music has a lot more music than spotify, I really hope the app supports apple music.. I love this app but it won't let me play songs from Spotify. Perfect for transcriptions and learning fast lyrics. Also I like supporting independent developers. This app is helpful and easy to use for learning parts from songs: currently using to take off Sax solos. Many options for importing files and sharing among audio apps, plus great and timely support! I work as a singer and I'm constantly learning new songs for gigs. This app has helped me so much. Thanks! Spotify integration, constant tweaks and improvements. A little extra cash than others, but you get what you pay for, and it's worth it! I have been using this app for a few years. It is the best out there for Professional and amateur musicians. This version takes iPad capability to another level by allowing imports from cloud services and other places as well. Let me let you in on another secret: It's looping capabilities are excellent for transcribing speeches as well. It is better than the apps supposing to be built for transcription. When you become proficient with its easy operation, you will be a transcription pro. I saw where one person rated the app low for something limited by apple. He has to keep in mind ITunes content may be DRM limited on some files. All the other apps, if I may share my opinion, are copy cats. A version of this apps for the Windows platform has been around since at least the 1990s. I wanted to speed up a song just a bit so I downloaded this app. I went to export it but could not find it anywhere in the music library on my phone. Where did it go once I pressed the export button? All the musicians I know use this. Keep up the good work! Only complaint: Wish I could get the desktop version w/ my iOS purchase too. Been using ASD on both computer and mobile for years and love it's functionality and simplicity. Spotify support and WiFi Import are awesome. Would love to see the ability to rename files. The title says it all. This is so useful. I do wish there were a way to reorder the songs in the library. I have a lot of active clips and would prefer to group them. Though perhaps there is a way to do this? I don't see a support forum, which would be a helpful resource for such questions. Beware Spotify integration does not work well. Could be great, but it isn't. I love the interface and the actual functionality of slowing down tunes with this app. The only problem is that it doesn't work with Apple Music, which nowadays is how I get my music. If you have a Spotify Premium account you'll be happy. Otherwise it's not worth it. Works w Spotify Premium which I just gave up for Tidal Premium. Cannot get songs to import from iTunes Instructions are dated and for old versions of iTunes. Waste of money. I've been using the ASD for years, and it is my favorite app of all time. I play in cover bands, and this app really is amazing for learning a song. I use this app a lot I mix and slow the music . One thing you should do is when we are done making our song let us put it in our music my library on my apple phone. Everyone that uses this app of my friends agree. Please consider!!!!! I find this an indispensable tool if you're serious about learning songs. Price is steep, though, and I'm sure this keeps too many people away. I'm a classical pianist and love using this app to examine at slowed down tempos what the professionals are doing. This app is so helpful! Thanks! Ever hear a song and wished you could slow it down without the pitch changing? Then this is the app for you! The Amazing Slow Downer (ASD) can do far more than just slow down songs. 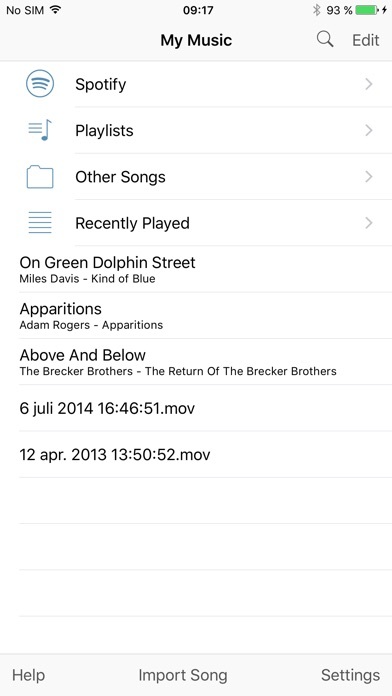 This application gives you the ability to manage your favorite music like never before. With the speed adjustment, pitch adjustment, and loop back features, you can hear your song the way you want to. Music AND Language! At the same time! I have had this app for years. At first didn’t use it much but then moved to China where I slowed down transcripts so I could copy the pronunciation (along with the tones). I am now using it to slow down songs so I can learn the rap portion in Chinese as well as instrumentals! Well worth the money I bought it for. I have dropped pitch of songs too. Does a good job of changing key without too much distortion. Bought and paid for, says it has been downloaded, won’t open. Now I can only find $50 option. Very Upset. Change the tempo or pitch of any song seamlessly without distortion, including tracks from the music library and Spotify.. super useful for any musician trying to learn, practice along with, or transcribe a song by ear. Great app!! It's good other than when you use the sliders, usually you can't change it by small amounts. It skips whole semitones so you can't really change it by less than two semitones reliably. Would be really nice to have audiobus capability. 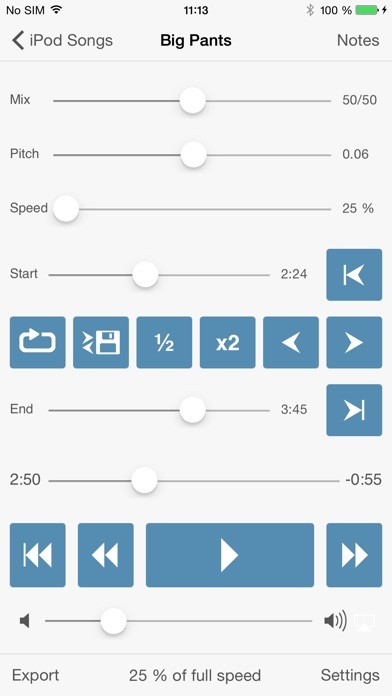 This app can be used in a performance setting using pre-treated audio recordings - and it would be great to be able to run it into AUM or other iOS based mixing platforms. Great app for pro musician. What would be cool would be to add a keyboard to the app so that you can play along within the app. As it is, I have to always be on an external instrument while I'm transcribing. First of all, the app does a great job at slowing songs down and maintaining pitch. My kids use this app to practice violin and they are able to slow down complicated pieces and hear the notes clearly. However, this app has several problems that need to be addressed to make it more user-friendly. 1)when you go to load songs from iTunes, for some reason it loads them in reverse order and you can't change them around once they're loaded short of deleting them. This means the first song you load becomes the last one on the list. Once you know this, you can begin at the bottom of the sing list and load them backwards, but this is silly and unnecessary. 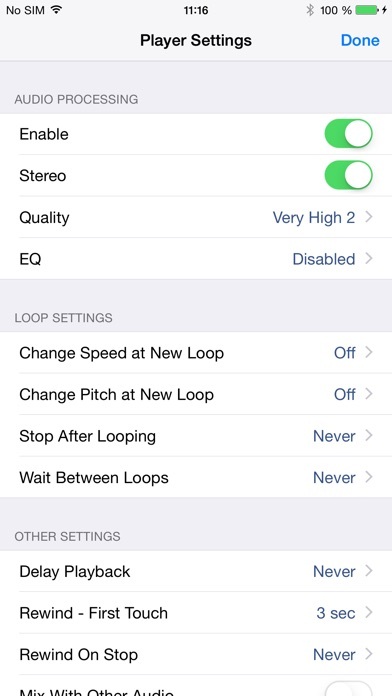 2) ASD only lets you load one song at a time as opposed to loading an entire album. Not only that, it does not remember where you just pulled your last song from. This means for every song from an album, you have to find it again in iTunes as though it were the first time. Again, silly and unnecessary. I thoroughly rely on this program for school, and I paid for the license on iPhone, but for some reason it started only allowing me to hear three minutes of a song, as a week ago I could hear 6 minutes. Who do I contact about this and how do I resolve this problem? This is an awesome app, everything I needed and more. Cutting my transcription time 3 fold. I would have rated it 5 stars only for the problem Apple created with its MP4 proprietary crap not allowing music you've purchased through them being used with ASD. I hold Apple/iTunes the blame for this. I paid for the use of the music I should be able to use it as I please. I've sent the request as ASD suggested to Apple requesting they allow ASD access to iTunes purchased music! I like the ability to access Spotify. However the interface leaves a lot to be desired. It is very difficult to start at a precise spot in a song and even more difficult to loop a portion with precision. Capo and Anytune show you a waveform of the music sonic they are much easier. But they do t have Spotify. The app is excellent but very little music is usable because of the copyright issues. They could probably be a bit more forthcoming on that I suppose, but all in all I can't really blame them for the publishers greed. I do recommend this app if you consider that caveat. I really like this but a couple of things....what would be awesome if they included a metronome/click track for the back ground, and also if they added when playing back at whatever percent below the normal speed it figured out what that tempo was like a metronome number. So if I'm playing back at 90 percent it would show up that new tempo. Another thing is the looper is kinda weird-not just in setting up your loop, but it doesn't seem to let you toggle between playing the full song and the loop back and forth and or saving it within the program. Other than that pretty cool. The app I've been searching for!! Great for all levels of guitarists. Import your music from iTunes and pick a song. Then pick a segment and loop it. Play it over and over. Slow it down or speed it up. Great to play along with to ensure you've got the timing down. Amazing. Worth the cash. Without the iTunes support, this is basically useless to me. When I tried to connect my Spotify account, it crashed and would not do anything. So far I’ve wasted an hour when I could have been practicing and transcribing. Terrible. I still have the Spotify playlists, but all the music from iTunes and from my Dropbox is gone. There is no way to import music, either. What happened to this amazing app? mp3s and m4as "unsupported file types"? Can't import music, and get messages saying that ASD doesn't support music file types. (?) When I asked tech for support, I got an email back saying that the problem definitely wasn't due to the app. How was that answer supposed to be helpful? Not looking to assign blame, just trying to get the app to work. Problem solving was needed. Roni Music tech unable to provide support. I understand language barriers, and I don't mind having to sift through garbled English--I really appreciate honest effort. Sadly, didn't get experience positive customer service. Expensive payout for zero production. Everything I need for music playback. Slowdown, pitch shifting, looping. Only drawback is it's primitive filing system which isn't that intuitive. I read that this update allows for media name edits which is a major step up. Works great and is easy to use. One of the best apps on the App Store for pitch and tempo shifting, definitely - the Spotify support is incredible! Great app. If I'm transcribing a song or want to practice a specific section, I like that I can make a short piece of the song loop. I'm not happy with how much I paid for it though. I didn't look terribly hard but I was surprised that I couldn't find a cheaper alternative. More than worth the price! More than worth the price! Truly a game changer! I tried cheaper options and their interface looked more interesting, but those looks were deceiving. Those others were difficult to effectively manage and really buggy. ASD proved to be “amazingly” intuitive, easy to organize what you’re learning, and completely bug free. You do have to “own” your iTunes music that is imported, and they have to be downloaded to your device—Apple won’t let you work in other programs with their music otherwise. I do pay for Apple Music, so I have to individually purchase those pieces I decide to accompany on my banjo. But that is a very small added cost for the time ASD saves when learning the song. Besides having quick and easy control of pitch and speed, the setting of focused sections of songs is very easy—I was setting focused loops on the fly the first night of practice using ASD. Each loop only took seconds to create and are automatically organized under a disc looking icon linked to the song. Having the loops organized with each song like that is one of the many details that make using ASD intuitive and effective. I do not typically leave reviews—less than a half dozen made in my lifetime across all platforms—so this review is a sign of how impressive and helpful this app truly is. Thanks for this great product! I've been using this app for years, and it remains my favorite app in music. It makes life so much easier as a piano player figuring out the lines of my favorite pianists. Been using for years. Sound quality is excellent. Ez and a tremendous aid. Highly recommend it. Updated 10/22/2027-still the best!! I am violin teacher and I use and recommend this app a great deal. However, there is one thing I would really love if the developers would consider (which would make this a 5-star review) and that is a way to adjust speed percentages by + or - 1 with the tap of a +-1 button just like you can with moving forward or backward in seconds. I would also love love love if you could either modify the small movements back & fwd or have more options available to do so (e.g. 5, 10, 15 seconds.) It would also be out of this world if you could develop place markers or tabs for points of difficulty that you could just jump to go practice. E.g. One at 1:36, one at 2:30, one at 14:53, etc. (Also would be great for jumping to the next movement in classical music). That being said I will continue to use this app and hammer on the << or >> 1 second button until this feature (hopefully) comes out. I haven't tried other similar apps (if they exist) but this one has been great to me, so am true blue all the way. Highly recommended. Get it. But has been so buggy the past couple of weeks that I will have to try an alternate product. Jams constantly.